1. Check under the hood area to make certain all filler caps are in place and all loose items (e.g. tools, oil containers, etc.) have been removed. 2. Lift the hood, grasp the padded area on the support rod, and secure the support rod in the clip. 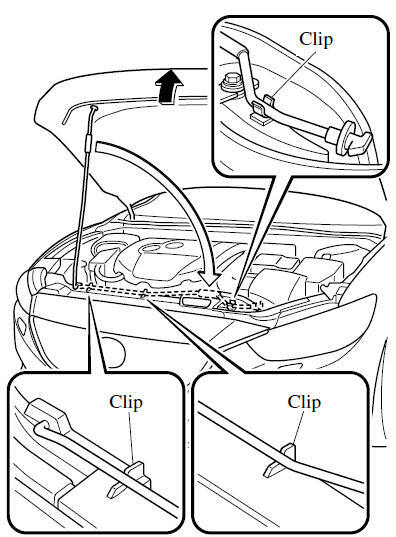 Verify that the support rod is secured in the clip before closing the hood. 3. Lower the hood slowly to a height of about 20 cm (7.9 in) above its closed position and then let it drop. When closing the hood, do not push it excessively such as by applying your weight. Otherwise, the hood could be deformed.